I love a brownie. Who doesn't? All that soft gooey chocolat-y-ness. The only thing is, they are not very glamorous are they? Try searching Google images with Brownie and you'll find an endless parade of uniform brown squares. Kind of the bridesmaid to the cupcake with all her showy swirls and sparkles and flowers and whatever else. Now, I know, what you are saying, it is whats on the inside that counts and that has been my mantra for many years. But, now. It's time. The quest for the glamorous brownie must begin and it begins here and now. This is my first attempt at a Brownie with Bling that I showed you recently, the gold is the Squires Kitchen Gold Lustre. I wasn't sure about the red, so I tried a different colour. Its a very different look isn't it?. I added a little Sugarflair edible lustre in dusky lilac to the roses for a bit of extra blinginess. I've used the traditional brownies from The Hummingbird Bakery Cookbook by Tarek Malouf, which is my most used cookbook. I may have mentioned it before? I have searched high and low and managed to find the recipe here. This is just the easiest ever recipe to make, didn't even get out my mixer. 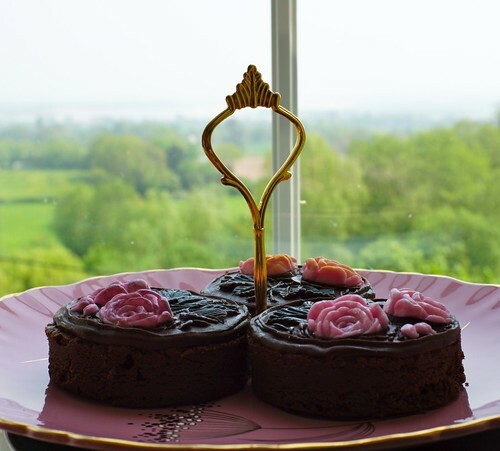 Use the round cutter to cut the brownies into circles about the same size as the design on the mould you are using. Any large leftovers can be cut into smaller shapes for eating as they are, decorating later or making brownie pops. When I went to make these. I thought, these'll be easy, just do as for my old rose cookies, mould the sugar paste and add paint on the petal dust colours right? Uh, no. Turns out only metallic or pearlescent colours show up. 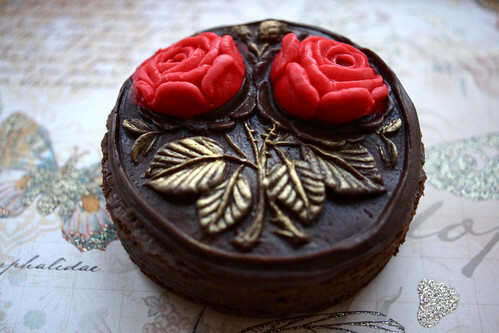 This is such a deep mould, whether you are using one or two colours, you need to make two little balls of fondant and press them into the rose part of the mould and then two tiny balls to push into the rose buds between the roses. I forgot to do the rose buds for my first mould as you can see from the pic below. 2. Press the mould on top - firmly and evenly to make the impression. 5. Carefully lift the sugar paste and place on top of one of the brownies. 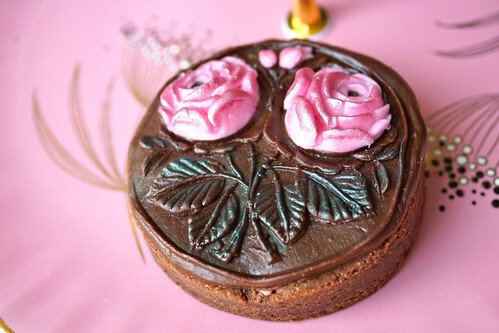 (You shouldn't need to use any edible glue because the chocolate sugar paste is quite sticky). Sometimes one of the roses or buds remain in the mould after it has been lifted off the sugar paste. Just gently tease them out with a toothpick or a small plastic cutting tool and gently place them in position and press down lightly. Use a slightly smaller ball of fondant.next time. For this time try using a toothpick to gently push back the coloured fondant towards the rose. Even is the mould is not perfect, these will still get eaten!